We’ve had a lot of beautiful lighting over the years but this lamp is definitely one of the prettiest and most unique lights we’ve ever had. 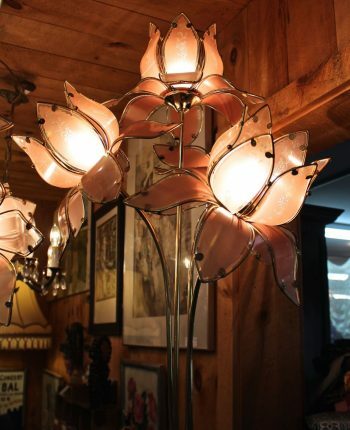 The lotus flowers are made of individual panels of pink glass petals mounted in brass. This lamp is over 5 feet tall with movable brass stems so the flowers can be adjusted to work in a corner space or in the middle of the room. Very good condition with some surface scratches on the base.